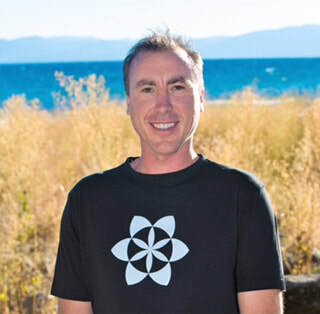 Well Being Tahoe Massage & Skincare - Well Being Blog. Author Nick Hughes explores various wellness topics. February is the time of year when we celebrate love. While Valentine’s Day is commonly focused on the more traditional definition of love- specifically the courting phase of a romantic relationship- all those heart-shaped decorations can serve as a timely reminder about the importance of cultivating heart-based energy. Love is an energy that takes on many different expressions. Just as a prism reveals that white light consists of every color of the rainbow, so the energy of love takes on a multitude of forms. From charitable love to familial love to romantic love to Divine love... it’s all love! It all stems from a common place: the heart center. So, how can we get more of this heart-based energy flowing in our everyday lives? To begin with, we have to figure out how to love ourselves. For many years I confused the concept of self-love with that of vanity. I thought that loving myself meant that I had to spend time gazing into the mirror, enamored by my own reflection. I’ve since discovered that loving myself really means nurturing myself. Self-love means taking care of my body by eating nourishing food. It means taking the time to stretch and breathe and receive healing bodywork. It means spending time in stillness, to quiet the mind, and spending time in nature, to revitalize the spirit. Self-love is also about recognizing that ‘love’ is a force of energy that runs through the fabric of all creation. Love is fundamentally who we are at our very core. Ultimately, love is what this whole universe is an expression of. So, to experience the blossoming of love in your heart right now, you simply need to get out of your own way. There’s really no need for fancy temples or long, complicated rituals in order to access this fundamental truth: that your body is the real temple. The Divine experience takes place here and now, in this lifetime, inside this body, radiating through this heart. The experience of love is an embodied experience because it takes having a body to experience it. The whole point of having a spiritual practice is to fine-tune your body and mind so that you can more easily access the flow of heart-based energy in your being. All you really need to do to experience this flow of love inside is to cease your internal resistance to it. You can do this anytime you like by taking a really big breath in and then completely relaxing any tension and resistance inside your chest as you breathe out. If it doesn’t work the first time, try it again and again until your heart feels open and your chest feels warm and light. This heart-based energy is always there, ready to flow through you whenever you need it. All you have to do is remember to check in regularly throughout the day and make sure that your central channel is clear and tension free. To keep this channel clear, imagine a hollow tube running up and down your spinal column, connecting the top of your head with the tip of your tailbone. By releasing tension in your heart, you are unclogging this central energy channel, allowing heart-based energy to flow up and down your spine and to gently spread from your chest throughout your whole body. Once the energy starts flowing, it's up to you where you decide to focus it. It's kind of like when you unkink a garden hose and the water starts flowing out- now you have to figure out where to aim the spray. Don't worry about making the wrong decision when it comes to expressing love. As I said in the beginning, there are infinite ways in which the energy of love can be expressed. As long as you take action with an open heart, you really can’t go wrong. As the northern hemisphere reaches the apex of its tilt away from the sun, we enter the darkest time of year. As a culture, we have developed traditions that aim to keep our spirits high during this trying time. We band together with friends and family to celebrate, feast and delight in each others company. The emphasis is on spreading joy and cheer and good will to all. However, for many of us, the holidays are the most stressful time of the year. How could a tradition that is designed to improve your mood actually cause you to feel worse about life? The solution to your suffering may be a lot simpler than you imagine. Here are three helpful hints to free you from stress during the holiday season. 1. Realize that everything is you. There is no escaping this basic truth: that everywhere you go, there you are. Every situation you ever find yourself in, there’s you right in the center of it all, experiencing it. As such, every experience you can have in this life is subjective. Reality is not just a thing that’s happening- it’s a thing that’s happening to you. Therefore, if you are at a party and you are not having a good time, you ought to know that it is not the party’s fault. You really can’t blame a party for being boring because your experience of boredom is actually an experience of yourself. The same goes for stressful situations like family gatherings. Is it really a stressful situation, or is it you that is feeling stressed? We go through life feeling like a victim of circumstance, trapped in the endless stream of life, powerless to overcome the current. Realize that you are the stillness at the center, you are the central filter through which reality is experienced. Everything that happens is essentially an experience of you. So, for goodness sake, relax and try to enjoy yourself. 2. Stop complaining. I was surprised to learn that the average person complains between 15-30 times a day. I actually thought it would be more, given that there are so many things to complain about. At any given moment, there is always going to be at least one thing wrong. Maybe it’s too hot, maybe it’s too cold? Maybe you’re hungry or maybe you ate too much and now you’re full? Are you tired? Does your back hurt? The list is endless - and don’t even get me started about the weather. Cutting down on complaining this holiday season is a sure way to bring more peace and joy into your immediate world. First, understand that having a critical mind means that there will always be a part of you that is evaluating your experience and thinking of ways that it could be better. The problem is, we subconsciously believe that everything should be perfect, all the time. When everything is not perfect, which is often the case, it causes emotional distress. Complaining occurs when you proceed to share this emotional distress with those around you. Like any habit, breaking out of the complaint cycle isn’t easy. It begins by paying attention to your thoughts. When you hear the inner critic speaking, pause for a second before giving voice to it. Are you about to unconsciously point out all the flaws that you notice? Ask yourself, will voicing this thought contribute to the collective joy experienced in this moment? If not, replace your original intention to complain with an expression of gratitude instead. 3. Practice gratitude. Expressing gratitude feels great and makes everyone happy. When you appreciate someone, it’s an expression of truth that comes from the heart. Sharing truth from your heart always feels good, but appreciation is a win-win- it makes the recipient feel good inside and it makes you feel good as well. You both get that feeling of openness and lightness inside the chest. Showing appreciation is a great way to generate more joy this season. Unlike complaining, expressing gratitude raises the collective vibration- and keeping the vibration high is the key to maintaining long-term happiness. By taking these three hints on board, you are much more likely to have a “happy holidays.” Remember, it’s not actually the "holiday" that needs to be happy, it’s "you" that needs to take responsibility for your own happiness. Keep in mind, at any given moment, there will always be something to complain about. At the same time, there will always be something to be thankful for. Where you choose to focus your attention is entirely up to you. Choose wisely. We often hear the word ‘namaste’ spoken at the end of yoga class. Some yoga teachers will even translate the sanskrit word for you, explaining how, “The Divine light within me honors the Divine light within you and recognizes that we are One.” This is a beautiful translation, but I have always been a little suspicious that a single word could have such a long translation into English. I also hold my hands in prayer, bow forward, and say ‘namaste’ at the end of my yoga classes, so I felt like it was time for me to do some research to determine the real definition of the word. Finding out the literal translation of ‘namaste’ was a bit of a disappointment, to be honest. I had illusions about how saying namaste meant that I honor the divine spark inside you and I realize that the same divine spark resides inside me. I thought it was about recognizing the one, true light of consciousness that shines through us all. It turns out that ‘namah’ is actually the verb, ‘to bow.’ Whereas, ‘te’ literally translated as ‘to you.’ So, put the two together and you get, ‘I bow to you.’ This explains why namaste is typically said along with a bow, but it doesn’t explain where our convoluted western definition of namaste came from. Is it possible that we have been lying to ourselves this whole time? I continued my research into this ancient word and I eventually found some redemption. I learned that the word ‘namaste’ was originally spoken only in instances when one is bowing in reverence to God. So, on a spiritual level, the ‘you’ that the bow is directed to is actually the Divine Self. Learning this small point helped to bring things back full circle because, with namaste, you are not just bowing to the physical person in front of you, you are bowing to the soul, or divine light, within them. This is all well and good, but what about the notion that we are all ‘one.’ If I have light inside me and you have light inside you, then why is it necessarily the same light? To wrap your head around this, imagine it’s a sunny day and that sunlight is streaming in through a window. If you pull a curtain down in front of the window, it will block out all the light. Then, if you take a small pin and make hundreds of holes in the curtain, pretty soon you will have hundreds of tiny pinpricks of light. Each pinprick of light is individual and separate from every other pinprick of light. However, it’s all the same light- the source of the light remains the same, it’s just been focused into individual expressions. So, the next time you hear or say namaste, remember the source of spiritual light and take a moment to honor the way in which we are all connected. Imagine that it’s early in the morning and you are floating on Lake Tahoe. You are balanced on top of a paddleboard, grounded into your feet, with your hips relaxed and your knees slightly bent. The sun, still nestled behind the mountains in the East, is sending a warm yellow glow up from behind the treelined peaks. The wind has yet to pick up, causing the surface of the lake to be as smooth as glass. The horizon of the cloudless blue sky is fringed with pink and orange hues. The only sound you hear is your paddle as it gently moves in and out of the crystal-clear water. You take a deep breath and can’t help but smile as you become fully immersed in the present moment. Paddleboarding is so much more than a trendy new way to get your exercise and strengthen your core muscles. Under the right circumstances, it becomes a moving meditation, with profound benefits for the mind, body and soul. Let’s explore each of these benefits in greater detail to discover what makes moments like this so transcendent. 1. The mind. There is something about stillness that brings great peace of mind. Standing on a perfectly calm lake, away from the hustle and bustle of the modern world, it is easy to let the constant chattering of the mind fade into a whisper and, eventually, into silence. Stillness is the natural state of the mind, the silent womb from which we all emerged and to which we will all return someday. The mind’s primary job is to think- to evaluate and problem solve and figure things out. However, when you are out on a paddleboard in the early morning, you realize that there is no need for problem solving because there is nothing wrong. There is nothing to accomplish or fix or change or compare to. The mind can finally be given permission to let go and be at peace. The thinking mind is sometimes compared to a glass of muddy water. By continually agitating the glass, the sediment will swirl around and stay suspended in the liquid. By keeping the glass perfectly still, the mud will eventually settle down to the bottom of the glass, allowing the water to become clear. In this metaphor, our thoughts are the sediment swirling around, whereas the water represents the clarity of pure consciousness that is undisturbed by thought. 2. The body. One thing about paddleboarding is that you have to keep your body balanced or you will soon end up in the water. That means keeping your feet firmly planted, with equal weight between the left and right foot. It means standing up straight without leaning too far forwards or backwards. It also means staying loose and flexible in the ankles, knees and hips. If you are too rigid, the smallest wave will knock you off balance. The trick is to be strong yet flexible, rolling with the motion of the waves. You soon become aware of your center of gravity, located just below the naval, and you learn to rest your focus there. Also known as the ‘dan tien', this area is the source of energy and vitality in the body. Floating on top of such a large body of water, especially one that is completely still, can also have a deeply calming effect on the body. This is because all matter is made of energy and, as a result, everything puts off a distinct vibratory pattern. Lake Tahoe has 39 trillion gallons of water and it emits an overwhelmingly peaceful vibration. How does this vibration affect us? Well, imagine that you have two brass singing bowls, placed side by side. Because the two bowls are made of the same material, you could strike the bowl on the left and notice that the bowl on the right will eventually start vibrating as well. So you see, since the human body is at least 70% water, we have no choice but to vibrate at the same peaceful frequency of the lake. 3. The soul. Perhaps the ultimate realization of the soul is that life is beautiful. Or perhaps it is that all of life, and everything in it, is 'one.' I like to think that our conscious presence on Earth is what brings the world into being. After all, beauty is in the eye of the beholder and not necessarily in the scene that is being beheld. Imagine what sunrise on Lake Tahoe was like before there were any eyes present to see it. Or before there were hearts and minds here to appreciate it. Was it still beautiful? That is an interesting question because, without a witness present, did it even really happen? Our witnessing of the Earth’s natural splendor is what makes it beautiful. Which is perfect, because our ability to recognize and appreciate beauty is what makes our time on Earth worthwhile. It’s what makes the whole creation of the universe worthwhile. Tuning into the soul means recognizing the fact that we are the witnesses- we are the ones that bring the beauty of life into being. One of the benefits of being a massage therapist is that I get to spend a lot of time in a calm, clear state. Over the years, I have given thousands of massages- which means that I have spent thousands of hours perfecting my inner tranquility. By creating calmness within, I am better able to share intuitive touch and healing energy, helping to foster relaxation in my clients. It is not always easy to maintain this equanimity throughout the day. However, I have learned a few tricks that I use to keep the peaceful vibes flowing. Here are a few suggestions that will help you remain calm regardless of your circumstances. 1. Stay grounded. One piece of advice that I received many years ago during my massage training at the Esalen Institute is to always stay in your feet. It sounds obvious, but we tend to forget that energy naturally seeks the ground. After all, a grounded electrical circuit is far less likely to get fried by a power surge than an ungrounded circuit. This is because all the excess energy will travel down into the earth and be neutralized. The best way to ground your energy is to be aware of your feet on the floor. In this way, any excess energy that is released during a massage gets sent down into the Earth instead of being circulated throughout your system. Keeping your feet relaxed and firmly planted on the floor not only allows you to stay balanced, it also prevents other peoples “stuff” from becoming your own. 2. Maintain good posture. In yoga, they speak about the importance of the “shushumna,”the central energy channel that runs up and down the spine, connecting the top of the head with the base of the pelvis. When this channel is open, prana (life force energy) can flow freely throughout the body. When the shushumna is blocked it can lead to feelings of stress, anxiety and ultimately to disease within the body. The best way to keep the shushumna open is to maintain good posture. This means that you have to be aware of the times that you let your posture go. My worst habit, especially when massaging, is to tuck my chin. This not only puts extra strain on my neck, it completely cuts off the flow of energy through my throat. Other ways to block the pranic energy flow include: furrowing the brow, clenching the jaw, shrugging your shoulders up towards your ears, letting the spine slouch, and tilting the pelvis too far forward or backward. Keeping your head balanced on top of your shoulders and your spine perpendicular relative to the floor helps to create a calm and balanced energetic state within the body. 3. Relax your breath. Our lungs are made up of smooth muscle tissue, however our breath is primarily the result of the diaphragm and intercostal muscles contracting and releasing. The diaphragm is located at the base of the lungs and, when it contracts, it pulls downward, causing the chest cavity to become longer. When the intercostals contract, they pull the ribs upward and outward, causing the chest cavity to become wider. The result of these two processes is that air streams into the lungs (otherwise known as an inhale). An exhale occurs when these two muscle groups relax. If you are trying to be calm for long periods of time, then you need to avoid holding tension in your lungs and in your breathing muscles. When you are stressed, it feels like the rib cage is pulling in towards the spine. The abdominal muscles lock up, preventing the diaphragm from performing optimally. Stress can make the chest and lungs freeze up, causing the breath to become short and shallow. The best way to keep calm is to ask yourself, "Are my lungs relaxed right now?" Bringing attention to your internal tension is often enough to release the 'grip' of anxiety, allowing the lungs to soften and the breath to flow freely in and out. By practicing these three suggestions, you should be able to remain calm no matter what situation you find yourself in. You may even come to the realization is that there is, in fact, no such thing as a stressful situation. This is because situations, in and of themselves, are not stressful- it is you that is creating the stress inside yourself. How you choose to interpret a situation determines whether or not your breath gets tight or stays loose. However, if you remember to stay grounded in your feet while maintaining good posture, with an unclenched jaw and relaxed lungs, then there is no way that stress will ever overwhelm you again. 1. Sitting is difficult. Having to sit on the floor was perhaps my biggest concern going into this training. The fact is, I have never been comfortable sitting down cross legged on the floor. My hips and ankles are very tight, causing my knees to jut upwards at a comical angle. I end up having to engage my core to stop me from falling over backwards. This core tension prevents me from breathing deeply and eventually throws my back into spasm. I wish I could say that, by the end of the training, I was sitting comfortably in the lotus position but, alas, that was not the case. I’d say I was almost to the point where I could just about endure sitting on a bolster for an hour or so- then I’d have to stand up to get some feeling back in my legs. I’ll never understand why the ancient yogis didn’t just use chairs- maybe they hadn’t been invented yet? 2. Yin yoga feels amazing. As the perfect counter to all the hours I spent sitting on the floor, I was also practicing Yin yoga at least once a day. Up to this point, I have always been a flow yoga guy, happily bouncing from one pose to the next. Little did I know that the real magic of yoga is found when you slow down and let the stretch really sink in. Yin yoga primarily involves deep hip-opening postures and forward bends, held for 3 to 5 minutes at time. Honestly, we did many of the yoga poses that I tend to shy away from due to my hips, hamstrings, and knees being so tight. It was an exercise in humility to face my physical limitations, especially in a room full of advanced yogi’s. However, when it comes to yoga, I learned that being more flexible doesn’t make you more spiritual. Even if you need to use two blocks and a blanket to hold a pose comfortably, as long as you are taking it to your ‘skillful edge,’ you are going to get the benefits of the stretch. Ultimately, in the quest for enlightenment, it doesn’t really matter how far you are able to bend. 3. Restorative yoga is deeply healing. If you think that Yin yoga sounds relaxing, then you’ve got to experience restorative yoga. This is the style of yoga in which the goal is to completely relax and release all stress and tension from the body. Deep postures are held for up to 15 minutes with the aid of straps, bolsters, blocks and blankets. It’s like taking a series of power naps as you lay in various yoga poses while being fully supported by props. Our restorative classes were often held in the evenings, right after sunset. It was in these classes, holding poses for extended periods of time while releasing all inner resistance, that I experienced the most profound healing effects. Letting go of the chronic tension in my hips and spine felt so nice. It was like warm honey, slowly dripping through my vertebrae and into my joints. I never knew that practicing yoga could be so relaxing. 4. Yoga is an energetic state of being. When you are in state of yoga, or ‘union,’ it’s as if your personal energy circuit is complete. A completed circuit allows an energetic current to flow freely throughout the system. In a state of yoga, you are connecting to a higher vibration, one that generates from deep within. This energy radiates outwards into space from the center of your being. It then circles back to the center before radiating outwards again in a perpetual loop. One way to maintain this energetic cycle is to dedicate yourself to a daily spiritual practice. I learned that practicing hatha yoga, meditating, eating well, exercising, breathing and singing mantras all day long really can make you feel more vibrant and alive. After ten days of yoga, I felt more clear, centered and balanced than I have in a long time. In conclusion, what I learned at yoga school is that walking the spiritual path is not the same as taking the easy way out- it requires sustained effort and dedication. Yoga, when practiced consistently, can feel make you feel great. If you are lucky, you might even catch a glimpse of what it’s like to be at one with the entire universe. However, you can’t just attend a random yoga class here and there and expect to feel wonderful all the time. Being a yogi means committing to a lifestyle, one in which you take the time to love and heal yourself every day. My home for ten days. 1. Food. One of the best things about being alive on Earth is the fact that you get to eat every day. There are just so many delicious flavors and textures to experience and appreciate. Sometimes the need to constantly quell our hunger can get a little tiresome, however there is nothing quite as satisfying as a good meal. If there is another life after we die, chances are that eating food will not be a part of it. Without a body, there will be no need to take in calories and nutrients. Without teeth, there can be no chewing. Without taste buds, there will be no flavors to experience. Without a stomach, you can never feel satiated. Eating food is one of the essential pleasures of life, so take the time to enjoy all the deliciousness while you are here on Earth because you might not get another chance to eat again after this. 2. Gravity. As a solid being made up of physical matter, you are subject to the same laws of physics that govern the rest of the universe. As a result, the force of gravity is always pulling your body downward toward the Earth. This sounds like a bit of a drag, but physically existing within a gravitational field is not necessarily a bad thing. In fact, gravity makes it possible for you to do all kinds of enjoyable things. Take skiing and snowboarding, for example. All you need to do is get up to the top of a snowy mountain and then let the force of gravity do the rest. Although the idea of a perfect afterlife holds a great deal of promise, I am sorry to say that there won’t be any ski resorts in the beyond. To ski, you first need mountains that are covered in snow- something that can only happen in a physical universe. You also need to have a body if you want gravity to have any effect on you. So, remember to go out and enjoy the laws of physics while you still can. I encourage you to run, jump, dance, ride a bike, climb a rock, go swimming- enjoy all the activities that are only available to you here on the physical plain. 3. Massage. Many of us can’t wait to get through the earthbound stage of existence so that we can finally be free of our bodies and return to a pure, energetic state of being. However, possessing a solid form does have certain perks. For example, as physical beings, we are blessed with the sense of touch. You will not be able to get a massage after you no longer have a body. While it’s true that your muscles can sometimes ache and feel tight, it’s also true that releasing this tension and stress feels amazing. Getting a good massage is one of the best experiences you can have in this lifetime. Unfortunately, massages will not be available to you in the afterlife due to your inherent lack of form. So, remember to experience the gift of healing touch while it is still a viable option. I don’t claim to know what happens after we die. Hopefully it's something so indescribably wonderful that my life on Earth will pale in comparison. However, if I get to the heaven and I’m given a golden harp and fluffy cloud to sit on for the rest of eternity, then I’m going to be miserable. Honestly, if there is no food to eat, no mountains to ride and no massages to give and receive, then I think I’ll ask if I can go back to Earth for another spin. Given the choice, I think I'd rather have a body, thank you very much. In conclusion, we need to change the way we think about our time here on this planet. Life is not some substandard experience that we have to endure in order to get to the real paradise on the other side. In many ways, this life is it. This world is the paradise that we have been seeking all along. And there are plenty of reasons to celebrate physical reality, it's not just limited to the three I listed. Everyday things that we take for granted like laughing, singing, dancing, hugging, kissing, and creating music and art are all possible thanks to the physical properties of existence. What is your favorite thing about being alive? ​Life is a subjective endeavor. When it comes to reality, there is what is happening right now... and that is it. The entirety of our life experience takes place right here in the present moment. Everything else is just our personal interpretation of what's going on. Yes, we have memories of present moments gone by and expectations about future moments that have yet arrive but, let's face it, these only exist as thought forms inside our heads. The present moment is all that there is- all we can do is choose to accept it or reject it. Knowing this, it is more important than ever to be conscious of the way that we react internally to what is happening around us. Our unconscious tendency to resist the present moment is one of the leading causes of stress in the modern world. Here are some ways we can move away from a state of chronic resistance and into a state of acceptance. 1. Watch your expectations. One of the most common reasons to reject the present moment is because it does not measure up to the perfect moment that you conjured up earlier in your imagination. Be careful of perfectionism because it sets you up for failure every time. Life isn't always perfect, sometimes there are errors, flaws, and unforeseen circumstances which occur despite your best intentions. However, just because something goes wrong on the outside doesn't mean that something has to go wrong on the inside as well. Better to accept imperfection and stay calm and balanced within than to resist imperfection and suffer through the resulting stress. 2. Be patient. Another cause of resistance towards the present moment is our subconscious desire to escape this moment and get to the next one. It's not that the next moment is necessarily better than this one, it's just that we have grown tired of this moment and we can't wait for it to end. It doesn't really matter what the next moment is, just as long as it’s not this moment anymore. This is how impatience works and it has a way of ruining everything. When you spend all your time wanting to get to the next moment, you are missing out on your chance to be in this one. This resistance comes up all the time, so be aware of it. You could be having a lovely meal at a restaurant and be genuinely enjoying yourself. Then, at the end of the meal, you ask for the check and it takes far longer than expected. Suddenly, what was a nice, pleasant moment turns into an unbearable hell. Why do we now feel so trapped and desperate to leave this place? It’s because we have moved from acceptance of the moment and into a state resistance to it. 3. Be grateful. A major shift takes place in life when you stop fretting about all the things you don’t have and start appreciating what you do have. Without this basic gratitude running in the background at all times, you can never truly be satisfied. We all want a better life, a newer car, a bigger house, a better job etc. It’s okay to want these things, there is nothing wrong with having goals. However, if you determine that you are failing to live up to your own lofty standards, then you are going to get depressed. You have to begin by being grateful for what you've already got or else you will find yourself in a state of perpetual resistance to what is. Try making a list of all the things that you are grateful for. Anytime you find yourself feeling down because you wish you had more, come back to this list. The truth is, you don’t really need more, bigger, better things in order to be happy in life. Happiness is found moment to moment, as long as you remember that you are whole and complete already. In conclusion, being in the present moment means consciously choosing to cooperate with it. Don't worry, you will have plenty of time to practice making this choice during your lifetime. Life will continue to throw various circumstances at you and you will always have the choice to either accept or resist the present moment. A stress-free existence means letting go of the need to control and learning how to go with the flow. So, the next time you are feeling dissatisfied, see if you can catch that feeling and then let it go before it ruins your ability to fully be here, right now. Falling in love is an incredible experience! There is that giddy feeling of expansiveness inside your chest, along with butterflies in your stomach. There is the feeling of being uplifted, as if you are walking on air. There is the overwhelmingly positive notion that life, right now, is perfect- just the way it is. Then there is the recklessly optimistic feelings about the future, full of happiness and unlimited possibilities. If only we could feel like this every day. Well, maybe it is possible, but first we must learn how to be in love with life. Here are three steps to help you on your journey. 1. Let it go. To be in love, you first have to fall in love. And “falling” in love suggests the need to surrender yourself to the process. If you want to be in love, you first have to let go of the struggle, the constant tension and inner strain that accompanies the human experience. We waste so much of our energy trying to control what happens in life. Let go of the need to be in control- release any regrets about the way things went in the past, along with any fears about the way things might turn out in the future. Let go of feelings of shame, blame and unworthiness. Let go of self-doubt and the unrelenting pressure you feel to survive and succeed. As you begin to let go of the basic struggle of daily existence, you will notice that you now have all this extra energy available to you. You can then take the energy that you have been wasting on worry and regret and learn to cycle this energy back into your being, raising your vibration in the process, while giving you access to boundless energy. It’s like the deep sigh of relief that you take upon realizing that there really is no need to panic- that everything is going to be ok.
2. Connect to Source. While it is known by many names- Prana, God, Reiki, the Life Force- all these names are referring to the same thing- the omnipresent, infinite field of pure love, consciousness and creative intelligence that we can all tap into if only we knew the right method. Here in the third dimension, we tend to think of Heaven and/or God as being “up there,” above us. So, naturally, when we go to connect to Source energy, we imagine bringing it down from above, through the top of the head and into our being. If this technique works for you, then great! However, this method assumes that there currently exists some sort of barrier or division between you and this infinite field of Source energy that underlies all life. The truth is, you are it! We are it- this is it! So, instead of grasping for the Light, simply relax and let the life force come to you. Source energy doesn’t come from above or below, it generates from deep within your being. This is the same life force energy that is present inside each and every cell that makes up your body. To channel the Source, simply cease all internal resistance to it. First, imagine an infinite field of light. Then, release the unconscious grip surrounding your spinal column. Breathe deeply into your heart, release all pressure in your throat and dissolve all barriers and blockages inside your head. And that's it... keep breathing and let the light shine through! 3. Act lovingly towards others. It's known as the Golden Rule and it is the central message of all of our world religions- to treat others the way that you would like to be treated. Love is often confused with the blissed out feelings of infatuation that you experience when you first have a crush on someone. But, to really be in love, you first have to own it- you have to be love. And to be love, you must act towards others as if you are love. Fortunately, there are billions of people on Earth, which means you have billions of opportunities to practice kindness, compassion, and patience towards others. It really comes down to an individual choice. Do you choose to behave as if you are, fundamentally, an expression of love? Or, do you want to pretend like you are not really this Source energy, manifested into physical form? The choice is yours. However, if you do decide that, deep down inside, you are love, then it is imperative that you act accordingly. Human beings have a tenuous relationship with time, mainly because the concept of time is very difficult for us to define. Time, as we experience it, is both subjective and objective. It's both an illusion and very real. Subjectively, time 'flies' when we are having fun and 'drags' when we are not. Objectively, we can view the phases of the moon, the growing of our fingernails and the graying of our hair and determine with certainty that days, months and years are passing by. We treat time as if it were a commodity. We tend to believe the assertion that "time is money," and so we try to spend time wisely. We are always finding ways to save time. We really don't like to waste time and, honestly, we wish we had more time. Unfortunately, many of us feel like there just isn't enough time and, as a result, we often get anxious because we feel like time is running out. As an example, now that September has arrived, notice that people around you will start to say, "I can't believe how quickly this year has gone by. Where did all the time go?" That is the thing about time. Despite our best efforts to stop it or slow it down, it keeps relentlessly marching on into infinity. I think people get particularly nervous when September arrives because, eight months in, we now find ourselves in the final four months of the year. We are no longer at the beginning of the year, or even half way through it. September signals the beginning of the end. We are running out of time - winter is coming! However, it doesn't need to feel this way. If we are able to better understand what time is, it may help soothe the desperate feeling that we don't have enough of it. The first thing we need to do is let go of the illusion that time moves in a straight line. In school we were taught to create 'timelines' in which events appear to occur in a sequential direction, starting on the left and ending on the right. From this we get the false belief that time moves along in a predetermined direction, with one event leading into the next. However, time does not 'move' because it has no physical properties- it cannot move. Time is right now, unfolding here in the present moment. Time never actually goes anywhere. What we commonly think of as time is really just changes in the spatial relationship between physical objects. Imagine, if you can, the Universe before the Big Bang occurred. No stars, no planets, no moons- nothing at all. It's interesting that, devoid of all physical objects, there is no time, just eternal presence. There is no time because it is impossible to track one object's progress through space in relationship to another object. The Earth's position in space relative to the sun is the basis of our objective concept of time. The Earth spinning on it's axis, wobbling like a top, and orbiting around the sun is what gives us our days, seasons and years. Much like the ticking of a clock, we recognize that a unit of time has passed whenever a full circle is completed. Time is not moving forward in this scenario. Time stays in one place, eternally present. Meanwhile our planet spins, wobbles and circles it's way through empty space. Instead of a using a timeline, perhaps a more accurate metaphor for the passage of time is to imagine a perfectly still body of water. Then imagine a large rock dropped into the water from above. After the initial splash- which takes place in the present moment- a series of ripples begin radiating out from the center and continue radiating outward forever and ever. Another way to look at time is to imagine a boat crossing a body of water. The people on the boat are in the 'now,' experiencing the present moment as it occurs. Looking back, they see a wake moving away in a long v-shape. The wake was created in the present moment, but now it is in the past- a distant echo of what once occurred here in the now. Next time you feel like there isn't enough time, take a step back and realize that, actually, all you have is time. Time is not running out- time is all that there is. In reality, the present moment is the only thing you will ever experience. You cannot go back and live in the past any more than you can travel forward to the future. All you can ever do is be here right now. By remaining rooted in the moment you will never run out of time again. ​Have you jumped in the lake today? If not, I highly recommend it. 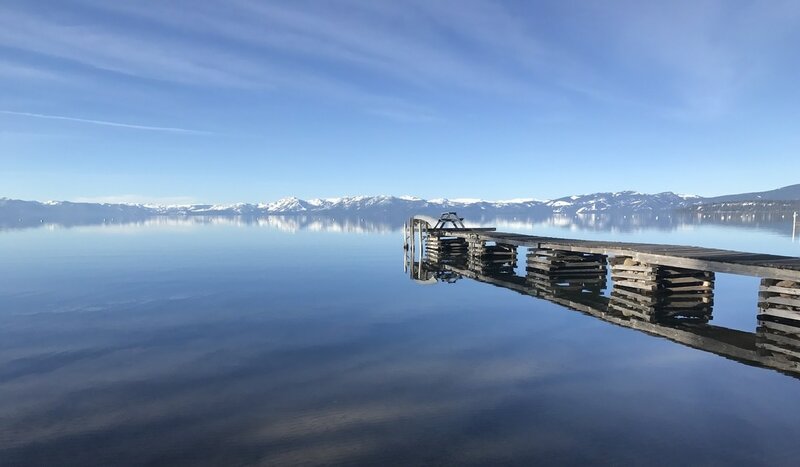 There is a reason that locals refer to Lake Tahoe as the ‘Blue Pill.’ Legend has it, a dip in the lake will cure whatever ails you- like a magic panacea for the mind, body and soul. It really does feel amazing, though- so cleansing and refreshing and invigorating! It is nearly impossible to go swimming in the lake and not come out with a big smile on your face. 1. Views of blue water boost well being. Researchers have studied the impact of living near various bodies of water. They coined the term ‘blue space’ to describe the time people spend gazing at bodies of water. Studies determined that increased views of blue space are “significantly associated with lower levels of psychological distress.” Other benefits of experiencing more blue space include improved mood, increased vitality and healthier sleep patterns. Blue spaces were even found to be more effective than green spaces (forests, rolling hills etc.) when it comes to overall stress reduction. Simply taking in views of Lake Tahoe, with its blue skies and even bluer water, is going to have a positive impact on your health. 3. Water puts you in a mindful state. Wallace J. Nichols, author of “Blue Mind: The Surprising Science That Shows How Being Near, In, On, or Under Water Can Make You Happier, Healthier, More Connected, and Better at What You Do,” believes that everyone has a “blue mind” which he defines as “a mildly meditative state characterized by calm, peacefulness, unity, and a sense of general happiness and satisfaction with life in the moment” that naturally arises whenever we are in, on, or near water. Gazing at water, observing all the subtle ways that it flows and ripples, allows your mind to take a break from the constant barrage of information that defines our modern world. In this state of “soft fascination,” as Nichols puts it, the mind finally has space to daydream and create. Studies have described the many health benefits of increased mindfulness, including lower stress levels, relief from mild anxiety, pain and depression, improved mental clarity and focus, and better sleep quality. After reading this blog, I hereby challenge you to take the Blue Pill. Put down your device, switch off your screen and immediately go jump in the lake. It is scientifically proven to the best thing you can do for your well being. If you can’t quite fathom the effort it takes to go for a swim, then at least go there and breathe in some negative ions. Remember to gaze deeply into the blue space for an extended moment, taking time to observe the waves as they lap gently against the shore. Then go jump in... seriously, what are you waiting for? I think, on some level, we are all trying to find ourselves. That's what the spiritual journey is all about, right? But 'finding yourself' is kind of a deceptive phrase because it suggests that there are two of you. There is the 'you' that is doing the searching and then there is the 'real you' that is hidden away somewhere, waiting to be discovered. However, in reality, there is only one 'you.' The one that's doing the searching- that's you! The seeker and the sought are, paradoxically, one and the same. What you have been searching for this whole time is, in fact, the essence of what you truly are. Identifying yourself as a 'finder' as opposed to a 'seeker' does not mean that your spiritual journey is over. On the contrary, things are only just getting started. Being a 'finder' doesn't mean that you can give up spiritual practices like yoga and meditation. The difference is that while you used to do these things because you were seeking the truth, you are now doing them because you are living the truth. The truth is that you are a human being that is alive here on Earth. You are a being, just like me- just like everyone else. Why you are here is a complete mystery, but living inside the mystery is part of the fun. All I know is that it feels great to be alive in this body and that we truly are blessed to be here on this beautiful planet with all these other amazing people. Finally, being a 'finder' doesn't mean life stops being difficult. Life is always going to throw new challenges in your path, that's how you learn and grow as a person. You don't have a lot of control over what happens to you during your lifetime, but you can take responsibility for your own physical, mental and emotional well being while you are here. Being a 'finder' means that you no longer see yourself as a victim of circumstances- as if you were on a tiny sailboat at sea in a thunderstorm, getting tossed around by giant waves. Instead, you begin to identify as the ocean itself. You realize that, by deepening your breath and focusing your mind, you are able to bring the surface of the 'ocean' into perfect stillness- to the point that it becomes like a mirror, reflecting the sky. What is love? The most common definition of love is a ‘mutual romantic attraction between two individuals.’ However, I am interested in a discussing a higher concept of love, a concept that recognizes love as a positive vibrational frequency. Not the energy that exists between two hearts, but the energy that comes from one heart. Have you ever met someone who radiates love? There is no denying that some people have an inner glow about them. If you stand a little closer to these people, you’ll find that this is not just a sparkle in their eyes but also a warm, peaceful energy that you can feel emanating from their being. In their presence, you feel both peaceful and uplifted- perhaps even inspired. What is their secret? How can we reach a point where we begin to freely emanate this beautiful energy with as much effortless ease as the sun when it emanates light? The answer is not that simple. Attaining this state of being is the ultimate goal of any spiritual practice. It is not something spontaneous that happens to you by accident, rather it is the result of a daily process whereby you work diligently towards embodying this loving state of being. Cultivating a loving presence involves the ability to still the mind and breathe into the heart center. It is important to recognize if your continual stream of mental activity is bringing you down or lifting you up. Being aware that there is a stream of thoughts running through your head at all times is the first step. Being able to separate yourself from this thought stream is the next step. While you can’t stop a river from flowing, you can step out of the river and sit on the bank, watching the water go by. This is the essence of meditation. One thing you might notice is that many of your thoughts are fear based. We mostly worry about the future, or regret the past. We worry whether or not we will have enough time or enough money or enough energy to survive. In order to cultivate a radiant state of being, we have to release these fears. Know with all your heart that everything is ok and, more importantly, that everything is going to be ok. In order to cultivate a radiant state of being, we have to have to simply be present. Only in the present moment are we able to breathe deeply into our hearts while manifesting abundance and well being. Speaking of your heart, there is a reason that Valentine’s Day features so many hearts. It makes sense because the heart is where the ‘love vibration’ radiates from. According to studies undertaken by the Heart Math Institute, “the heart generates a powerful electro-magnetic field.” They go on to explain that “The heart’s magnetic field, which is the strongest rhythmic field produced by the human body, not only envelops every cell of the body, but also extends out in all directions into the space around us. The heart’s magnetic field can be measured several feet away from the body.” Read more about the Heart Math Institute here. Finally, there is one more thing you can do to cultivate love, which is to find the thing you are most passionate about, and then doing that thing- as much as you can. Whether it’s skiing, jogging, painting, dancing, singing, or reading- the point is to do what you love every day in order to get your internal positive vibrational frequency going. The truth is, we all have this love vibration inside of us right now. It’s not something outside of us that we need to channel in from a separate source. We are the source. By doing what we love, we encourage this energy to flow throughout our beings. Only by finding this love inside of ourselves and cultivating it on a daily basis can we expect to be able to share our love with others.